A social network is a social structure containing people who are part of the same group, just like a community or a neighborhood. Social networks work just as well in the offline environment. They are formed by people who meet each other frequently, such as in school or at their work place. However, these networks have few members, while the Internet is used by millions of people and a large part of them are interested to meet and bond online. This is why social networks use sites, as most of its members have at least one thing in common, such as the same hobbies, the same religion or political views. Once you start accessing these sites, you socialize (this includes looking at people’s profiles or even contacting them). One of the many advantages of using social networks is friends meeting. When in school or at your work place you only have access to your colleagues, which means you don’t get to meet a lot of people. So, another major advantage of social networking is that you get to know new people, from around the world. This means that no matter what country you live in, you can make friends with someone from another continent; not only that you get to make new friends, but you can also learn about other cultures and mentalities. 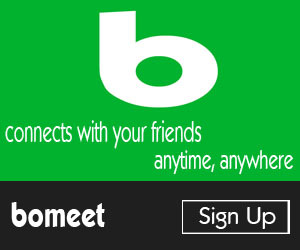 Bomeet is an advanced social network platform from Malaysia, launched in 2014. Just like other social network sites, it can help you get in touch with people around the world or find old friends. It is still developing, but its goal is to become the world’s no. 1 social network. It is also suitable for iPhone and Android, so you can download its applications on your phone. If you want to be a part of this social network you should take a look at the career opportunities they provide in Sales, Engineering, Product and Business Operations. You can also create an ad and place it on their site. It can be written in any language that the platform supports. For this you will need a Bomeet account and a credit card, as you will have to pay if someone clicks your ad. You will know the exact costs when you create your first ad. Also, you have the opportunity to select the audience for your ad, so only the members you choose will be able to see what you post. The costs will also depend on the targeted audience.